There are some weird food holidays we are never going to celebrate. Like National Broccoli Day. Broccoli’s OK, but we don’t want to eat it all day long. Or National Caviar Day. We don’t have the budget for that one. But we can totally get on board with National Pancake Day, which is celebrated on Sept. 26. What’s not to love about a warm, fluffy, golden pancake swimming in syrup? 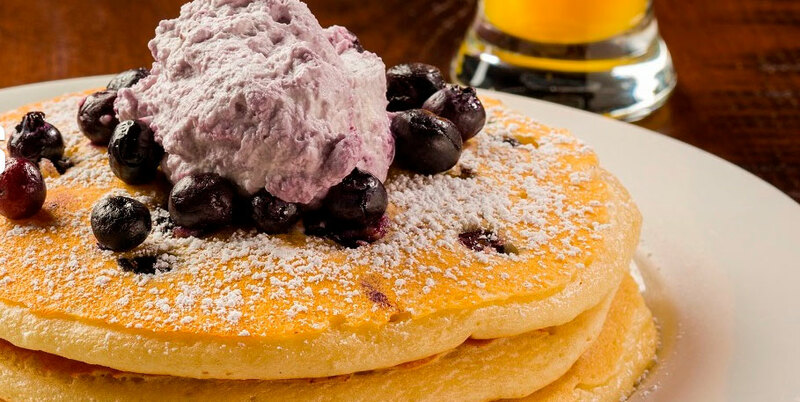 To prepare you for this Saturday’s festivities, we came up with some of our favorite places in Las Vegas to get a good pancake. 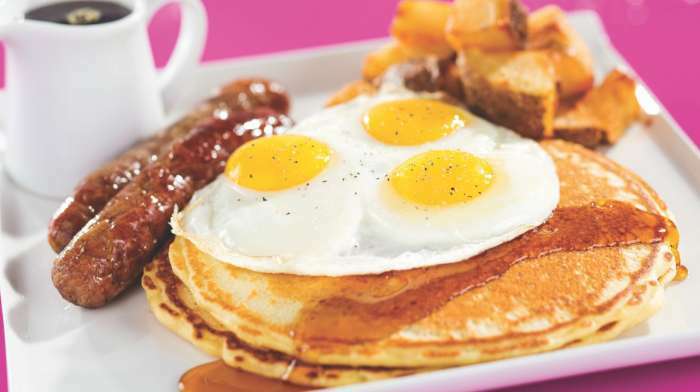 Du-Par’s has been a Las Vegas staple since 1955 and it’s known for its pancakes, which have received accolades like “Best Pancakes in America” by Esquire Magazine. The pancakes are available 24 hours a day and can be ordered in a stack of five or a short stack of three. They’re served with Grade AA melted butter and boysenberry or maple hot cake syrup. If you’re really hungry you can try the Stackzilla Pancake Challenge. 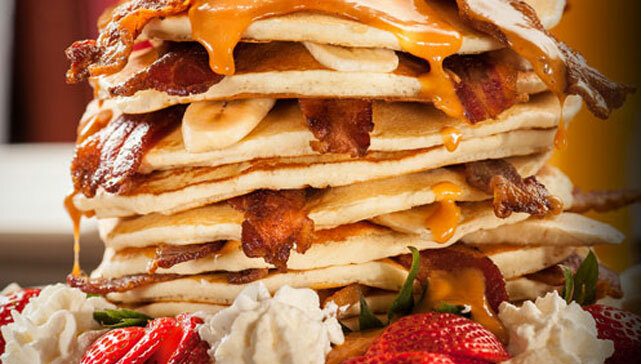 Earn your Stackzilla title by devouring a stack of 10 pancakes in 15 minutes. 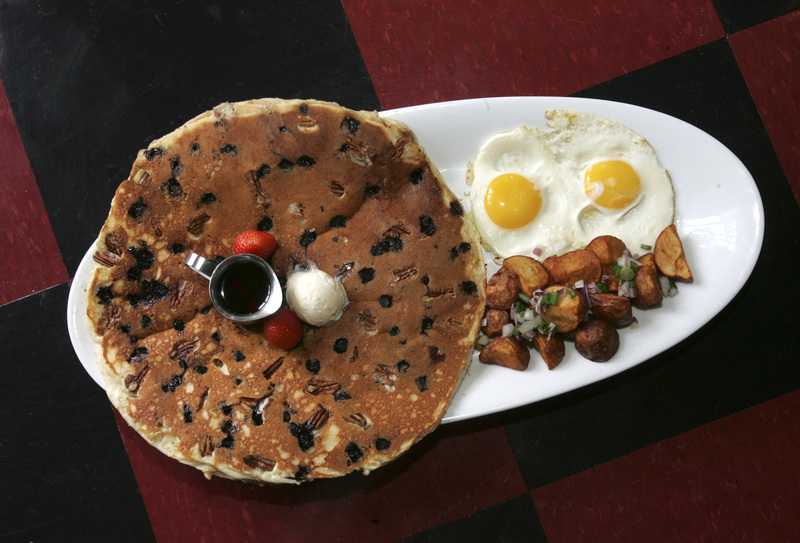 Hash House A Go Go serves up some seriously big pancakes. You can order them in the original buttermilk or in other amazing flavors like blueberry, pecan, brown sugar, blackberry granola, Snickers, butterscotch almond, apple cinnamon, mango, coconut and strawberry Frosted Flake. We’ll take one of each. 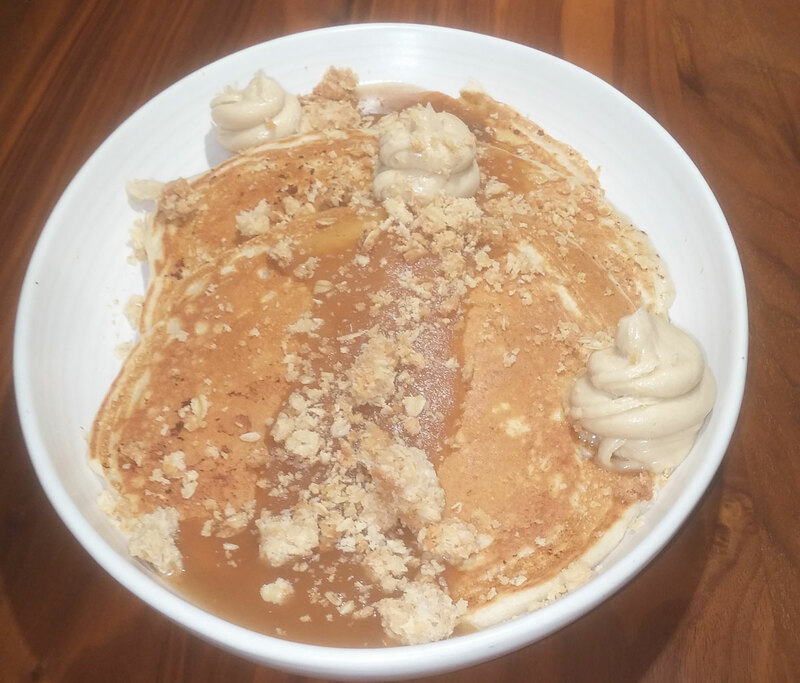 We love anything with salted caramel so we love that the pancakes at Tom’s Urban are served with salted caramel butter and maple syrup. You’ll get a stack of three and you can either choose original buttermilk or the lemon poppyseed blueberry with sweet cream. The Bacchanal Buffet serves more than 500 foods so it can be hard to decide which ones to try. 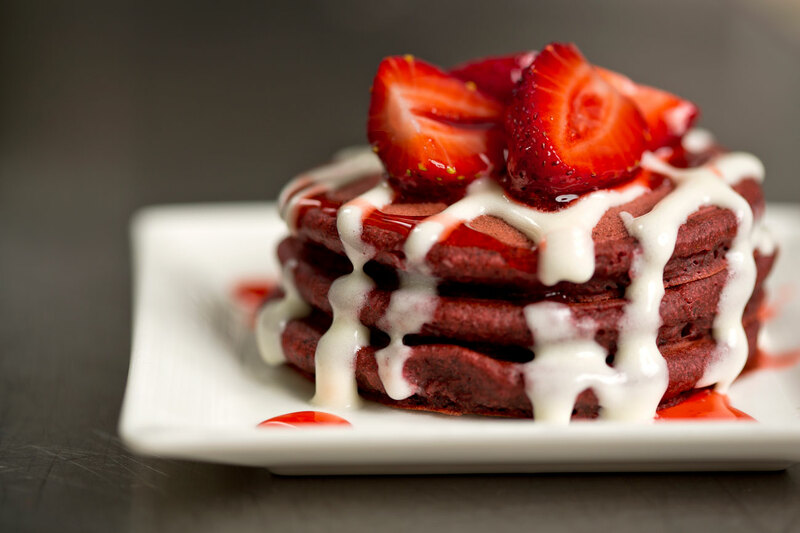 Trust us, you’ll want to be sure to hit up the breakfast or brunch buffet for mini portions of their red velvet pancakes with cream cheese glaze and fresh strawberries on top. You get three small pancakes in each serving but hey, it’s a buffet so you can go back 20 times if you want. 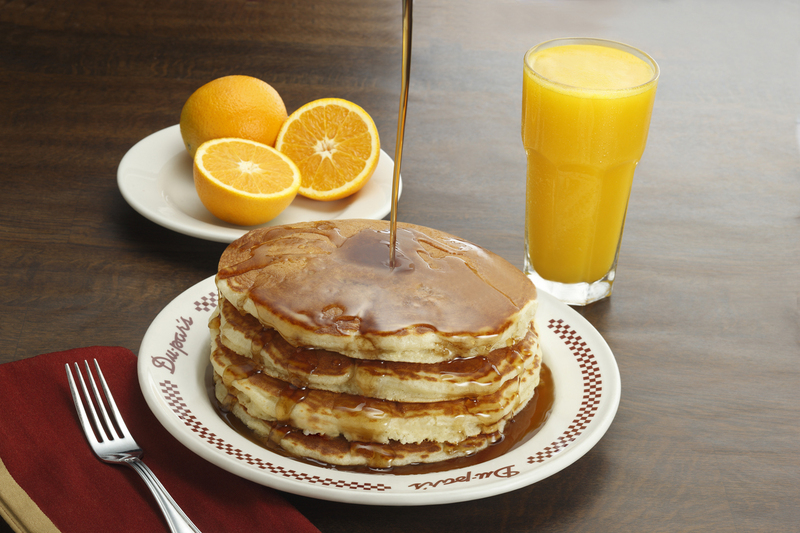 We love the variety of flavors in the pancakes at Northside Café. They come stacked three high, served with honey butter and maple syrup. You can get classic buttermilk or things like blueberry pancakes filled with berries and topped with blueberry whipped cream. The caramelized banana pancakes are available with add-ons like caramel, candied walnuts and streusel. The carrot cake pancakes are filled and topped with candied walnuts and raisins with cream cheese frosting, and the red velvet are rich chocolate pancakes topped with cream cheese frosting and chocolate shavings. Yes, please. HEXX has all kinds of delectable sweets and they’ve made their pancakes taste almost dessert-like too. For breakfast try a carrot cake pancake with cream cheese frosting or a chocolate pancake with caramel syrup, fresh banana and powdered sugar. On the weekends during brunch you’ll also find a cinnamon apple pancake with apple butter, oat crumble and brown sugar butter or a blueberry ricotta oatcake with brown sugar, blueberry syrup, ricotta, lemon and almond butter. Eat, from chef Natalie Young, is a hot breakfast and lunch spot downtown and one of the popular menu items is the Golden Brown Pancakes with chicken-apple sausage. The pancakes are tasty, fluffy and dusted with confectioner’s sugar. If that’s not sweet enough for you they’re also served with pure maple syrup. Mr. Lucky’s is where you go if you have a bunch of friends who all want pancakes. You can share The King, which consists of 14 banana pancakes, 14 strips of bacon, peanut butter glaze and maple syrup. Elvis would be proud. They also have regular pancakes with vanilla butter and maple syrup as well as blueberry, banana, strawberry and chocolate chip options. MTO Café at Downtown Summerlin and 500 S. Main St.
Vegans will appreciate the vegan pancake option at MTO Café. It’s a carrot coconut pancake with pecans and agave nectar. MTO also serves a lemon poppyseed pancake with blueberry-ginger compote. If there’s anything better than pancakes for breakfast it’s bacon and the geniuses at MTO found a way to combine the two. 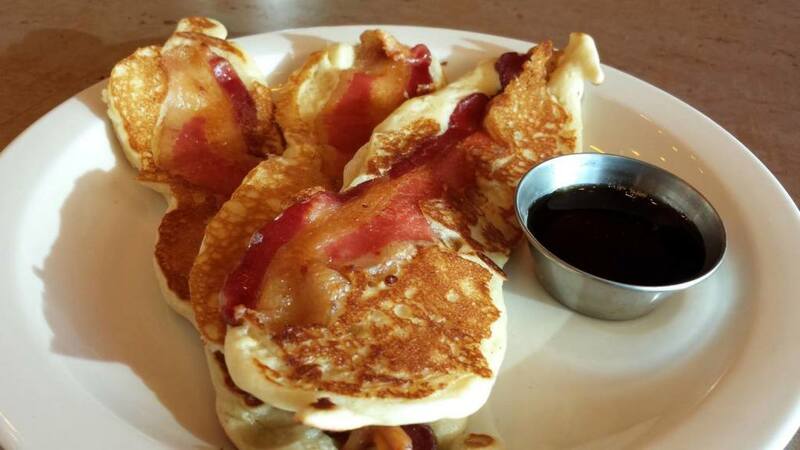 The bacon dippers are pancakes with bacon cooked inside that are shaped perfectly for dipping in the peppercorn maple syrup. OK, this one isn’t technically in Vegas but it’s a mere 30 minutes away and it’s the perfect stop on your way to or from Vegas along I-15 in Primm, Nevada. Original Pancake House serves classic pancakes made with butter, pure whipping cream, Grade AA eggs, hardwheat unbleached flour and sourdough yeast. There are 16 types of pancakes made from recipes created in 1953 including potato pancakes, buttermilk, cinnamon raisin, banana, bacon, buckwheat, chocolate chip, strawberry, pecan, blueberry and more. The restaurant also has some interesting signature pancakes on the menu like the apple pancake (oven baked with fresh Granny Smith apples and cinnamon glaze); the German pancake (oven baked soufflé style with lemon, butter and powdered sugar); the Dutch Baby (oven baked, dusted with powdered sugar, served with lemon and butter) and the Dutch Garden (filled with broccoli, diced tomatoes and mushrooms, topped with Gouda cheese). We’ve never measured them, but Serendipity 3’s pancakes are called Bigger Than Your Head Pancakes so we imagine they’re pretty big. You’ll get a double stack of fluffy pancakes in your choice of plain, chocolate chip or blueberry.